The journey of this young designer began at 15 when she used to take her mother’s head tie and make impressively elegant and trendy cloths for dolls. Genivieve Emma Bangura, who is by nature a determined person, continued to explore, create and design cloths despite her mother’s efforts to stop her from making cloths out of her head ties. On and on, through bumpy roads and high tides, she followed her passion till she is today not only able to do designs for dolls but for people in all different styles and designs. The most fascinating thing about Genevieve’s passion for design is that she does not only design to impress but also to express, especially to young girls, by conveying messages through her products, thus serving as inspiration in keeping their heads high, making good use of their talents and skills in the production of decent fashionable outfits/designs and earning themselves respect and independence. In an interview with Concord Times, the prioprietress of Jenny’s Closet said she doesn’t allow her financial challenges to be an obstacle in her pursuit to achieve her goal because she partners with some business people who give her materials that she designs and pays after sales. However, her work would be easier if she has support to be able to produce classic, smart and stylish designs without having to pay later. When asked how she intends to hit it big by making use of her undeniable skill and talent in designing, the young designer revealed her plans to stage a fashion night titled ‘GIRL’S POWER’ with the theme ‘A woman with skills is by definition a talented woman’. She would use the platform not only to stretch her wings for growth in the fashion industry but to positively influence young girls to be able to stand up against all forms of violence, abuse and exploitation. She is optimistic that that is achievable if girls focus on their education and/or skill training, and not allows men/boys to take advantage of their vulnerable situations, however banking on support from all and sundry to commend this laudable initiative. 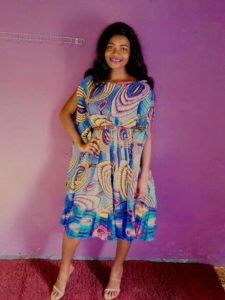 The Sierra Leonean born Gambian bred designer has a clue of both Sierra Leone and Gambian designs of all types and both sexes at affordable prices. At Jenny’s closet, they transform fabrics of all shapes and colours into unique functional and stylish designs.